Steve Kanayama has been a professional Tennis coach for over 17 years. His specialty is working with and developing high school and college players. Coach Kanayama, most recently coached Division 1 Script Ranch HS Falcons and Escondido Charter HS White Tigers. As a player Coach Kanayama played for the Palomar Comets and USTA Open division. 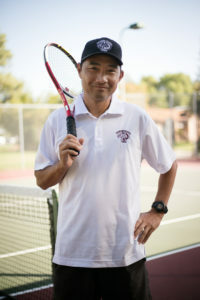 Coach Kanayama firmly believes hard work, commitment, passion, and team work are the key ingredients to have successful season in high school tennis. Coach Kanayama is very excited to work hard with his players and to have a successful season.